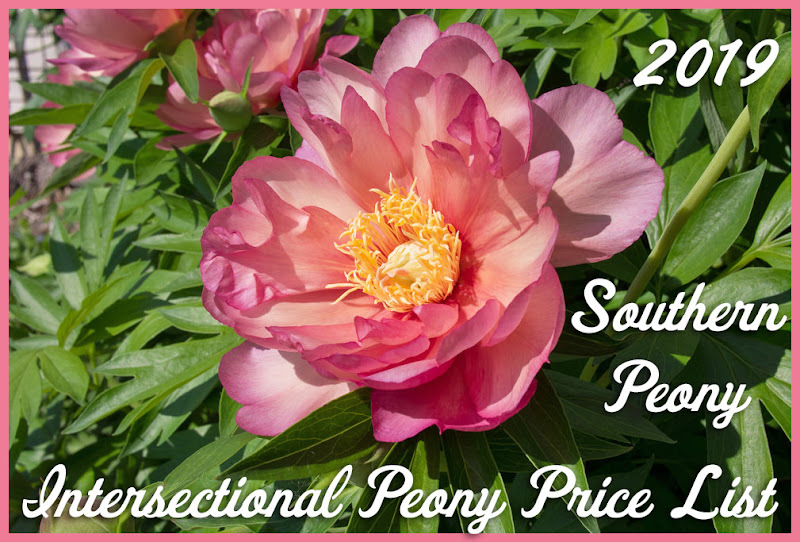 Almost a week ago we toured Adelman Peony Gardens during the 2018 American Peony Society Convention. It all went by so fast, but having the photos around to remind me of how beautiful everything was just brings back happy memories. Everything, and I do mean everything, was in its place and picture perfect at Jim and Carol Adelman's Peony Gardens. Their gardens and fields were just immaculate. Every detail of the tour had been considered down to the smallest detail. Every flower in their display garden had been clipped to perfection. Every border was neat and tidy. 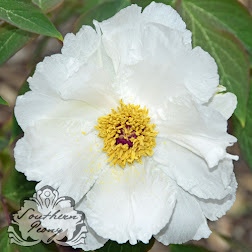 Their slip of land really does live up to the URL of their web site - www.peonyparadise.com, Peony Paradise. It is exactly that. Carol gave a wonderful introduction to her farm. She has the perfect mix of humor and brashness (or maybe just outright honesty) in her stories, and she is definitely entertaining to listen to. They also gave tractors tours of their expansive fields (growing expansive flowers). I don't think I've seen anyone grow peony plants or flowers as large as the Adelmans grow them. They seem to have the perfect mix of soil, rain, temperatures, and cloud cover to create the largest and most richly colored peonies in North America. Inside of the Adelman Peony Gardens sales office, they had cut peony flowers displayed in vases along with their variety name on a placard right in front of each vase. On one of the walls I found a few of Carol's American Peony Society Flower Exhibition ribbons, which appeared to be from 2001-2006. While there were many of them framed on the wall, I know there are many times that waiting to be framed somewhere. I bet she could fill up the entire long wall of her sales office with ribbons! I think Adelman Peony Gardens definitely has the most peony merchandise of any US grower I've visited. There were peony magnets, calendars, books, fertilizer, cut flowers, potted plants, and more. If you wanted for something peony, you found it. While we were touring the gardens, the Adelman's also hosted a lunch for the APS Members on site. They had rented a lovely tent and chairs, decorated every table with a beautiful bouquet of peonies - of course, and catered in Panera Bread boxes for the meal. The food was very tasty - sandwiches, chips, a pickle and a cookie. Drinks were served Adelman style - in the bucket of a tractor's front loader! And of course, many people were lined up after lunch for their chance to get an autographed copy of Carol Adelman and David Michener's new book, Peony: The Best Varieties for Your Garden Book. Of course I needed a copy to memorialize the occasion. The Adelman's display gardens could really be described as perfect, something that every home gardener would love to attain and achieve. They did have their secret sauce, aka Adelman Peony Gardens' Peony Fertilizer, for sale inside their sales office. It was a 10-8-8 fertilizer, with the nitrogen being slow release. Carol said that tulip and daffodil fertilizer was their secret, but I have a feeling there might be a little bit more to it than that. The Adelmans have really put their heart into their passion - growing peonies.